The phrase Novus ordo seclorum (Latin for "New order of the ages"; English: /ˈnoʊvəs ˈɔːrdoʊ sɛˈklɔːrəm/; Latin pronunciation: [ˈnowʊs ˈordo seˈklorũ]) is the second of two mottos that appear on the reverse (or back side) of the Great Seal of the United States. (The first motto is Annuit cœptis, literally translated "[He/she/it] has favored our undertakings".) The Great Seal was first designed in 1782, and has been printed on the back of the United States one-dollar bill since 1935. The phrase Novus ordo seclorum is sometimes mistranslated as "New World Order" by people who believe in a conspiracy behind the design. Medieval Christians read Virgil's poem as a prophecy of the coming of Christ. The Augustan Age, although pre-Christian, was viewed as a golden age preparing the world for the coming of Christ. The great poets of this age were viewed as a source of revelation and light upon the Christian mysteries to come. The word seclorum does not mean "secular", as one might assume, but is the genitive (possessive) plural form of the word saeculum, meaning (in this context) generation, century, or age. Saeculum did come to mean "age, world" in late, Christian Latin, and "secular" is derived from it, through secularis. However, the adjective "secularis," meaning "worldly," is not equivalent to the genitive plural "seclorum," meaning "of the ages." 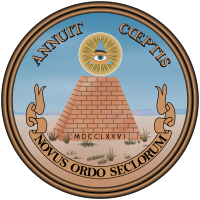 ^ a b c "Novus Ordo Seclorum - Origin and Meaning of the Motto Beneath the American Pyramid". GreatSeal.com. ^ P. Vergilius Maro, Eclogues, J. B. Greenough, Ed. ^ "The Great Seal of the United States," U.S. Dept. of State, Bureau of Public Affairs, Washington, D.C., July 2003, pp. 4, 5, 15. PDF of official brochure. This page was last edited on 21 March 2019, at 16:50 (UTC).